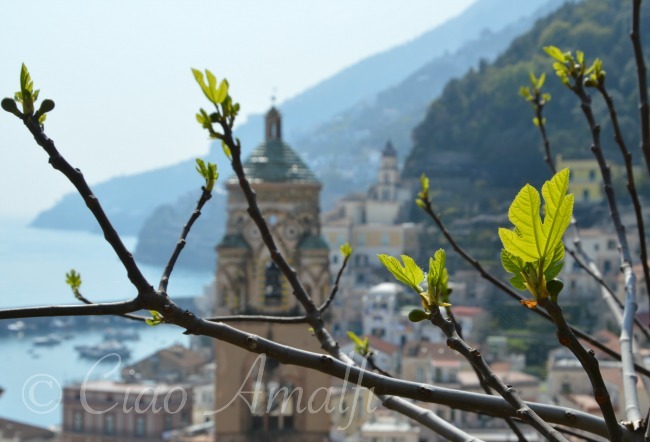 If you’re planning a trip to the Amalfi Coast, mark your calendars for June 20th to September 5th for the Ravello Festival. The 63rd edition of the popular festival dedicated to music, theater, opera, dance and the arts is set to be a blockbuster with an outstanding line up of performances. The Ravello Festival 2015 Program has been announced this week, and the selection is tempting. 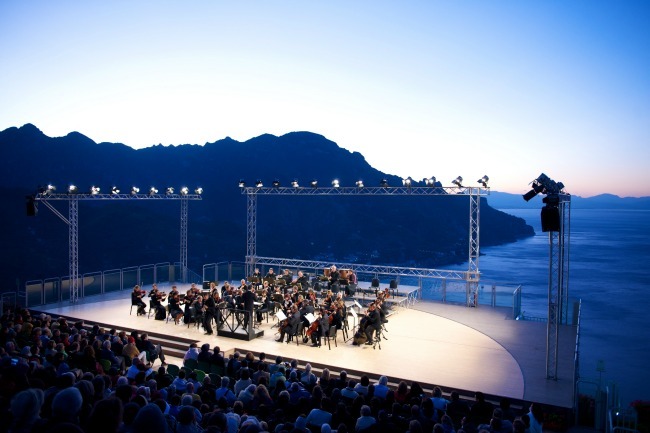 From world class ballet, classical performances and opera to the European exclusive concert by Philip Glass and Laurie Anderson or the lively Bobby McFerrin or Dee Dee Bridgewater, there’s a lot to choose from at this year’s Ravello Festival. The season very appropriately begins and ends with the music of Wagner, who visited the Villa Rufolo in 1880. 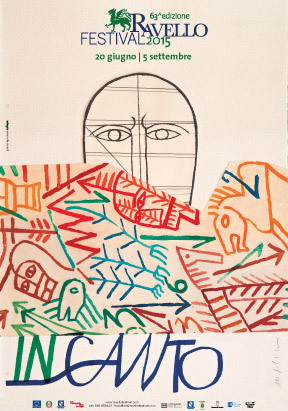 On June 20th there will be a ballet performance of Tristano e Isotta while the final concert of the season will be Parsifal, which is the opera Wagner was working on when he visited Ravello. Each year the Ravello Festival presents a theme, and this year’s is InCanto, a word play that highlights the various ways the human voice is used as expressive instrument (as “canto” means “song”) and the word “incanto” meaning “enchantment.” The Italian artist Mimmo Paladino has created a striking image to represent the Ravello Festival this year. Some of you reading may have seen the incredible installation of many of his sculptures on the terrace of the Auditorium Oscar Niemeyer in 2013. 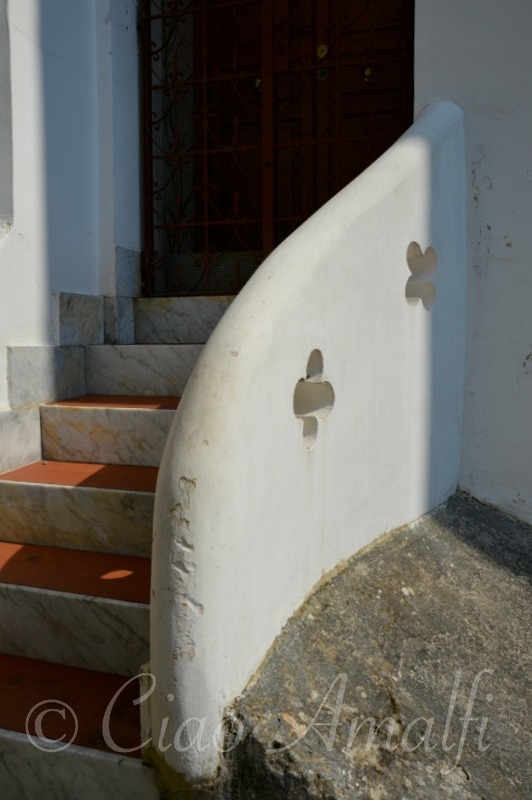 This year there will be an installation of work by the sculptor Augusto Perez throughout the Villa Rufolo and on the Auditorium Oscar Niemeyer terrace. Keep an eye on the Ravello Festival website as online ticket booking via their Box Office should be available soon. If you know your travel dates then it’s a good idea to book in advance as many concerts sell out well in advance. Also, it’s noted on the website, but I’d highly recommend paying a little extra for seats in the Tribuna Centrale – the central seating area. What’s the difference? Well besides being great seats it also secures you a seat should the concert have to be moved to the Auditorium Oscar Niemeyer due to bad weather. While the weather is usually good, I experienced this just last year. If I hadn’t paid a little extra for tickets then I would have missed the concert with Chick Corea and Stanley Clarke, which had to be moved to the Auditorium. Although you’ll be reimbursed for tickets in the Tribuna Laterale in the case of bad weather, it’s a disappointment to miss a concert you’ve been looking forward to on holiday! 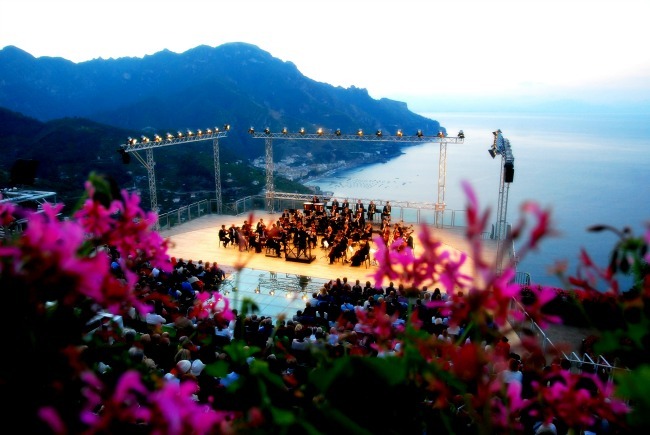 What concert would you like to see at the Ravello Festival this year? 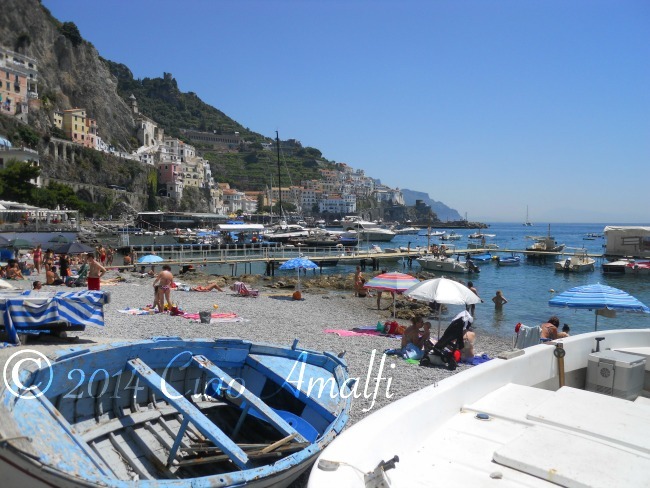 Planning a trip to Amalfi this summer and looking forward to some beach time soaking up the sun? 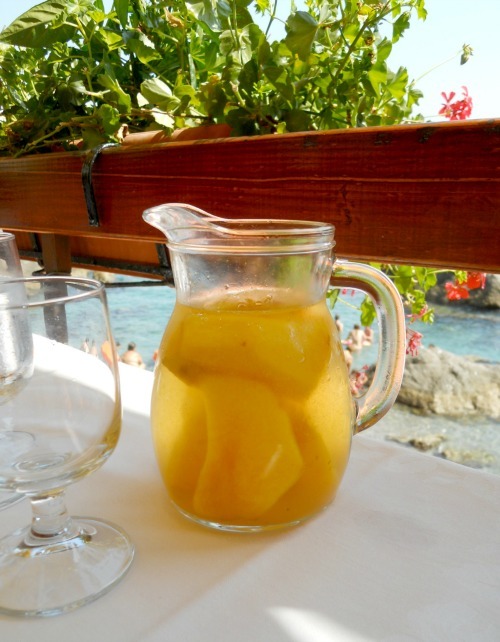 It’s definitely a must during your stay on the Amalfi Coast. 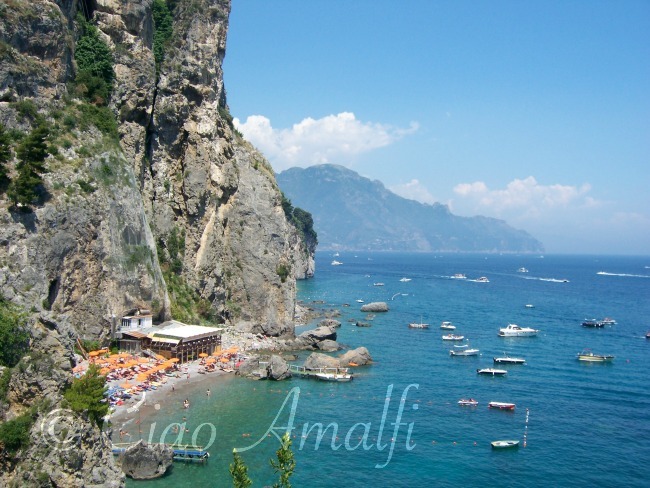 But did you know you had a choice for where to go to the beach in Amalfi? 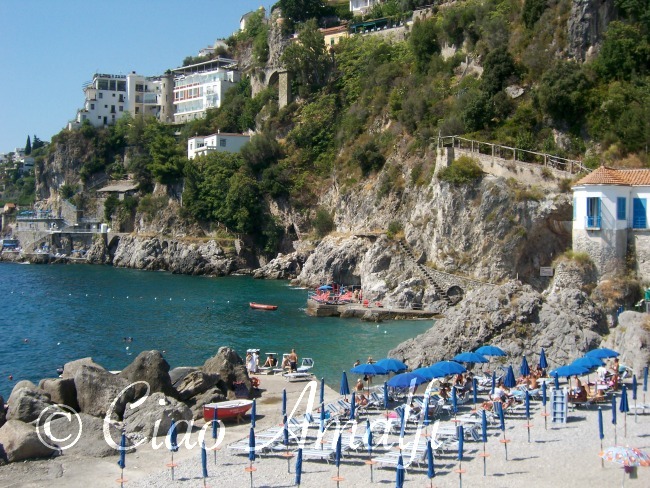 While it’s not very large, there are several beaches you can choose from right in Amalfi. I’ll introduce them to you all and you can pick which one to visit while you’re here. Warning: You might have to visit them all to pick your favorite! 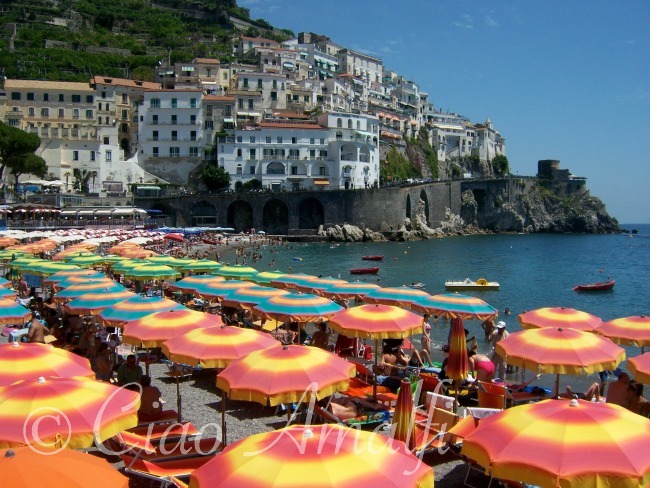 This is Amalfi’s main beach and you’ll spot it easily during the summer months with its rows of brightly colored beach umbrellas and sun beds. The beach is right in front of the center of the town across from Piazza Duomo. Every time the umbrellas change color it means you’re at another stabilimento balneare, or area where you can rent a sun bed, umbrella, usually take a shower and change and often have access to snacks, drinks or full meals. You’ll find many different options for where to settle in for the day along Marina Grande beach. For a more local (although locals definitely use the sun beds and umbrellas, too) and budget experience, head to opposite ends of the beach where you’ll see people have just thrown down beach towels or set up their own camps with umbrellas. Especially at the far end of the beach in the photo above is the most popular spiaggia libera, or a free beach, in Amalfi. 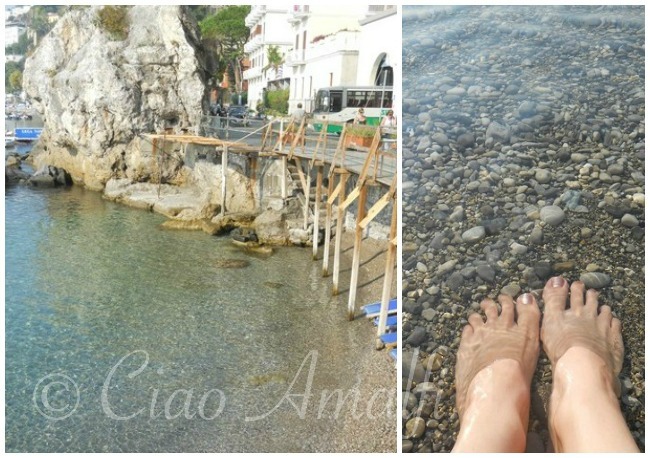 Insider Tip: Most of the beaches on the Amalfi Coast are rocky and this is definitely the case in Amalfi. Think large pebbles. If you’re just planning a quick trip to the beach or spend most of the time in the water then the spiaggia libera is a great choice for you. If you’re looking for a relaxing day at the beach, I’d highly recommend renting a sunbed since the rocks are not very comfortable. If the Marina Grande beach might feel a little too crowded for your taste, then walk along the harbor to the other end of Amalfi where you’ll find the Lido delle Sirene (Mermaid Beach) just beyond the confine of the port. It’s not a long walk, just about 10 minutes leisurely pace. Here you won’t find a spiaggia libera, but you will find an excellent beach service with shower, plenty of changing rooms and a restaurant overlooking the beach. Enjoy sandwiches on the beach or take a break from the sun and enjoy the views from inside the restaurant. Many locals, especially if they live elsewhere and come back to Amalfi for a period in the summer, reserve a sunbed for every day at this beach. As you walked along the harbor from Marina Grande beach to the Lido delle Sirene, you might have spotted a small beach area covered with towels and surrounded by docked boats. This beach is usually just referred to as the porto, or port, and is a very popular spiaggia libera with locals. It’s especially a top choice for families with young kids since the swimming area is shallow and the sea is calm. Although it can get a bit rowdy with kids playing during the summer! This little beach is tucked beside the restaurant La Marinella and they offer a small beach area and deck with sunbeds and snacks and drinks in the bar nearby. The water here tends to be remarkable clear and sparkly, which is oh so tempting when you walk by above. It’s another popular spot with families, especially with very young children, since there’s plenty of shade below the deck, the water is calm and the swimming area small. While it might not be the top choice for your holiday beach day, it’s fun to stop and peek down as you’re strolling by. Generations of Amalfitani have taken their first dip in the Mediterranean at this beach. 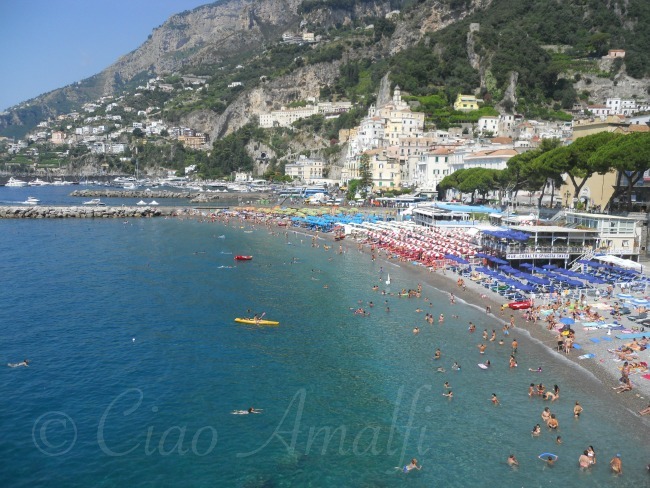 There are two options for reaching Santa Croce beach from Amalfi. One is to pay a small fee and take one of the boats that departs from where all the ferries depart in Amalfi. They are smaller boats and have a ramp that can be lowered down in the front, which is how you get off at Santa Croce. 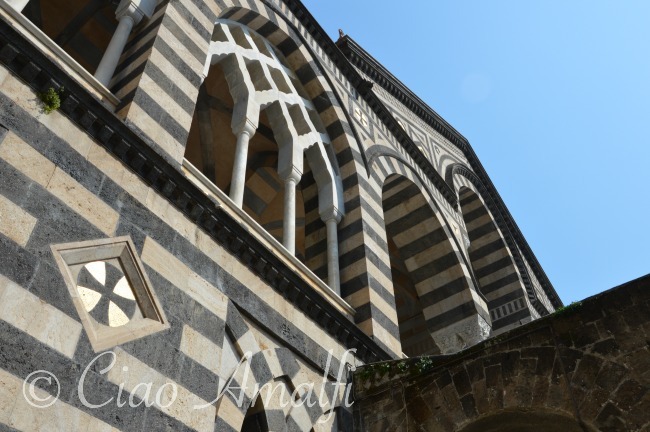 You can see one in this blog post from last summer about Santa Croce. As soon as you step off the boat you’ll see why this beach is so very special. The water here is just magical! The other option is to arrive at Santa Croce by the boat service connected to one of the two restaurants at Santa Croce. My favorite way to reach Santa Croce is to take the small boat run by the Ristorante Da Teresa. When you arrive there’s a small pier that leads to their beach area (with the bright orange umbrellas) surrounding the restaurant. You can rent sun beds and umbrellas and either eat a feast on the beach (they make amazing panini and fried calamari or my favorite – a mix of grilled veggies) or dine at the restaurant. Excellent food! And don’t forget the carafe of local white wine with peaches. We often get that for lunch down on the beach and they’ll give you skewers to spear out the big chunks of peaches. Yep, that’s heaven right there! With this guide you’re now set to hit the beach in Amalfi. If you have more than one day, I recommend visiting different beaches since they all have their own vibe and experience. Even the water can be remarkably different from one beach to the next. Most of all, enjoy your time al mare in Amalfi! While Amalfi, Positano and Ravello are familiar to travelers around the world, the Amalfi Coast is home to many other charming towns as well as hidden villas and hotels tucked away in between. 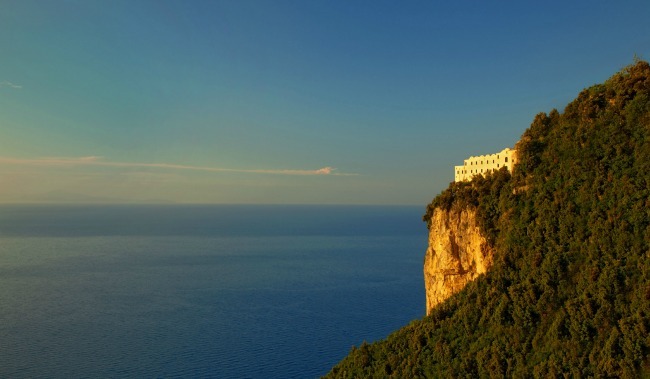 Let me introduce you to one of the most spectacular – the Monastero Santa Rosa in Conca dei Marini. Located between Amalfi and Positano, you may have spotted it from the sea. It’s a striking white building perched right at the very edge of a cliff. Once upon a time it was convent where the remote location and expansive views were ideal for a contemplative and quiet life. For fairytale Amalfi Coast settings, this one wins hands down. Built in the 17th century, the convent was a thriving part of the community of Conca dei Marini and is the birthplace of the delicious Sfogliatella Santa Rosa pastry. When monasteries and convents were suppressed in the 1800s, the convent was closed like so many across Italy. It had fallen into a state of beautiful ruin when American Bianca Sharma spotted it while on holiday in 2000. Thus began a decade-long personal quest to restore the convent and create a remarkable boutique hotel. 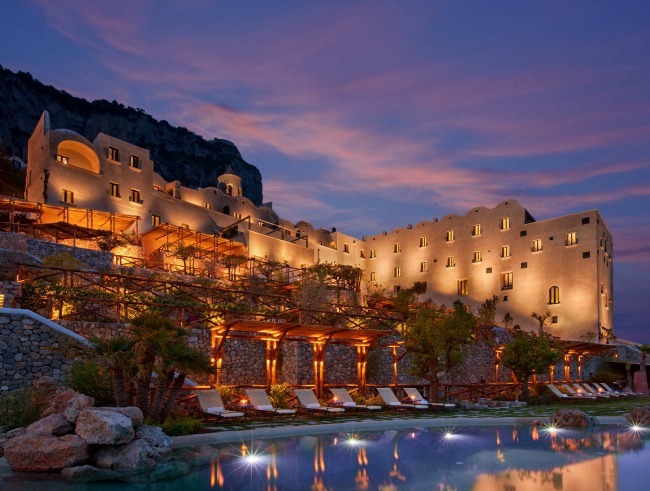 The spectacular setting is just the beginning of the magic of the Monastero Santa Rosa. Sharma and a team of architects and historians stayed true to the historic features and atmosphere while imbuing the hotel with a unique sense of luxury. 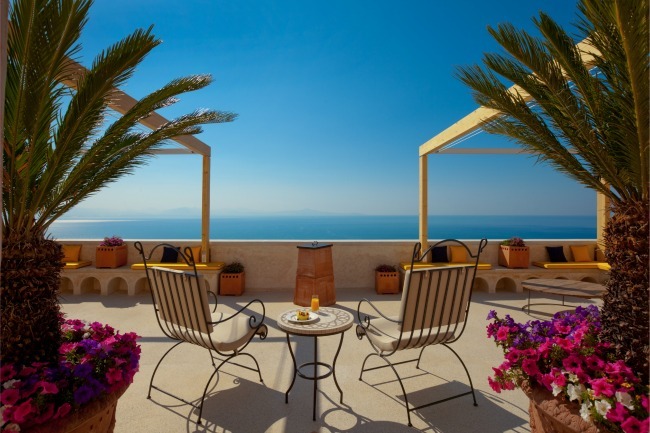 With only 20 suites, the Monastero Santa Rosa feels intimate and yet grand at the same time. Each of the rooms is named after an herb that the nuns would have cultivated in the gardens. 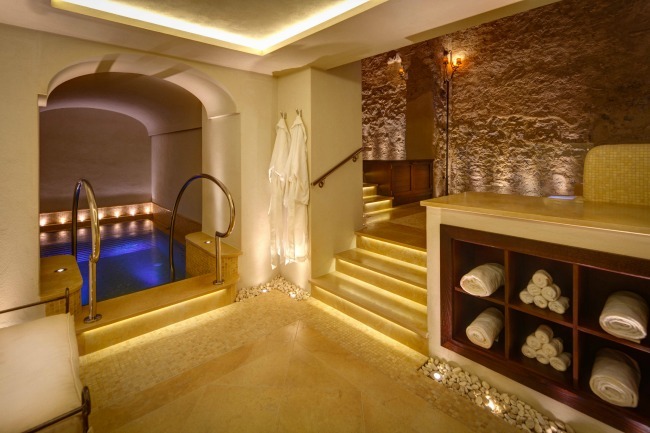 To create a true retreat, an extensive spa was added in the space where wine was one produced. A getaway spot in itself, the 750-foot thermal spa features treatment rooms, a sauna, steam room, a hydrotherapy pool and more. The hotel says most guests use the spa every day, which is easy to believe. I’m not sure I’d ever leave! If the spa wasn’t relaxing enough, then you’ll find plenty of chairs and sunbeds well placed throughout the terraces and gardens to kick back, enjoy a good book and soak up the sun. The extensive gardens meander down four terraces leading to one of the most incredible infinity pools with a view overlooking the Bay of Salerno and coastline. 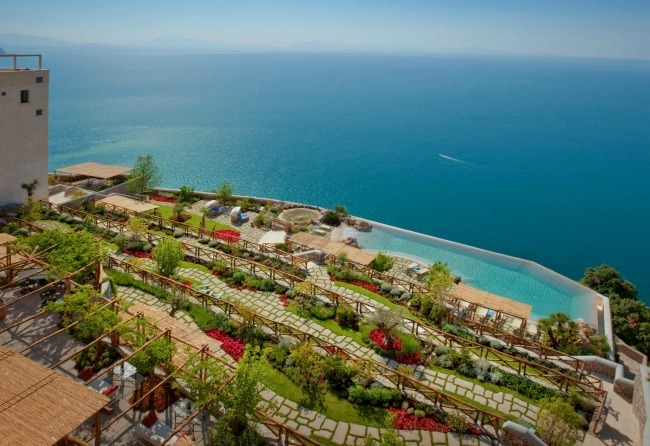 Recently the Condé Nast Traveler website feature the Monastero Santa Rosa and called it A Blissful Retreat on the Amalfi Coast. If you’re looking for a remarkable Amalfi Coast holiday spot where you can truly get away from it all, then I’d highly recommend the Monastero Santa Rosa. Do keep in mind that you’ll be a drive from Amalfi and Positano, the closest spots to catch the ferry, but the secluded setting is what makes the Monastero Santa Rosa so very special. Find a peaceful spot under the bougainvillea, sit back and get lost in that view. 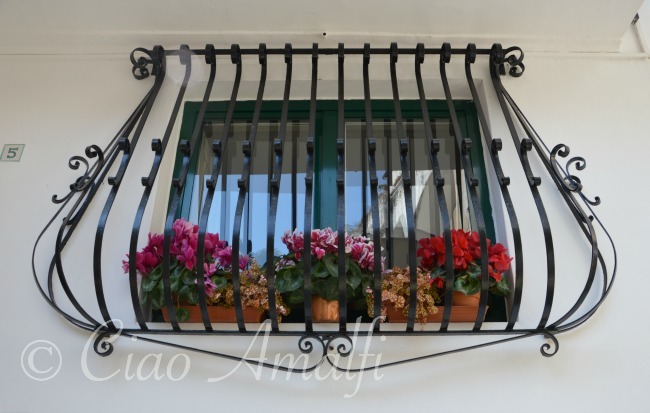 Note: I do not receive compensation of any kind for Amalfi Coast accommodation posts on Ciao Amalfi. All opinions expressed are my own. 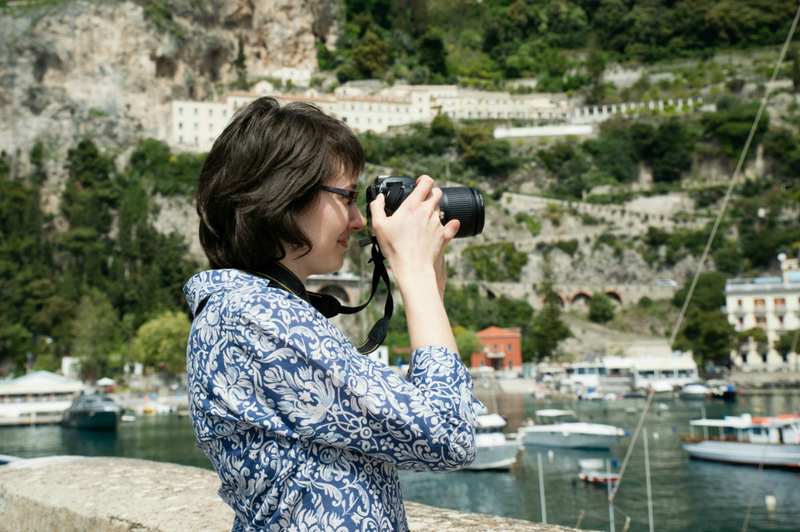 My passion is to share the best of the Amalfi Coast, including beautiful places to stay. 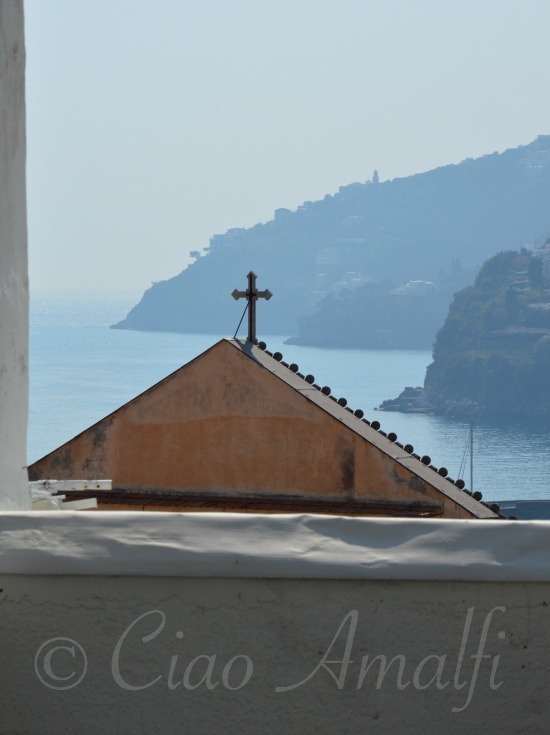 Follow this link to see more Amalfi Coast Accommodations. 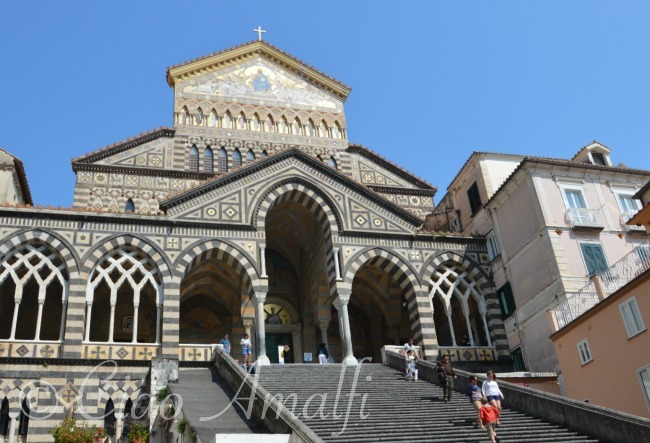 Standing in the center of town and looking up at the Duomo, or Cathedral of St. Andrew, is an experience you simply have to have in Amalfi. Sure, it can be a bit crowded during the busy season. But, look, did you see that view? Going to Amalfi and not standing in Piazza Duomo is like going to Venice and not seeing Piazza San Marco or somehow missing the Colosseum in Rome. I personally love the people watching in the center of Amalfi, and if I have some extra time I’ll grab a spot on that grand staircase and admire the scene. The next thing you want to do, however, is get lost. 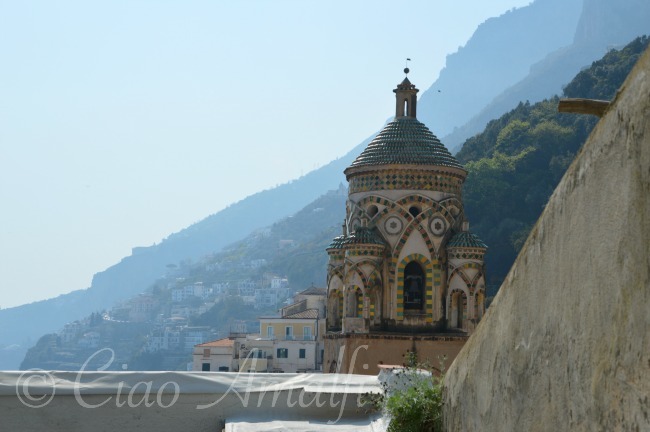 Amalfi is wonderful place to wander and explore. Pack a comfortable pair of walking shoes and start climbing! You could head in any direction from the main Piazza into the maze of stairways and narrow passages and find something unique. I’m going to take you along on a walk I took recently that lead up above Amalfi to a gorgeous panorama overlooking the Duomo from the other side. Come along! I started at the base of the steps of the Duomo and followed the small side staircase up to the left. Here’s my technique for wandering in Amalfi: If you want to explore, just keep heading up. If you’re worried about getting back to the main Piazza Duomo or shopping street, just head down and you’ll get there. My husband always tells visitors that they’ll end up on CNN breaking news if they actually manage to get lost in Amalfi. And please forget the map. You might miss pretty windows and little moments of daily life if you’re busy trying to follow a map. Just keep going up and soon you’ll start catching a glimpse overlooking Amalfi. It’s quiet when you get up higher since most tourists don’t know about this side of Amalfi or don’t take the time to get lost. Yes, there are a lot of steps, but there are also stunning views that not only make the climb worthwhile but are also great for stopping and resting. Now that’s a view of the Cathedral of Amalfi that not everyone sees! Did you recognize it? This was the view I was after on my walk since it had been ages since I had seen the Cathedral from above. I had this view to myself until a few locals huffed and puffed by with their daily shopping. Not a place to live up so high if you tend to be forgetful and have to run to store all the time! 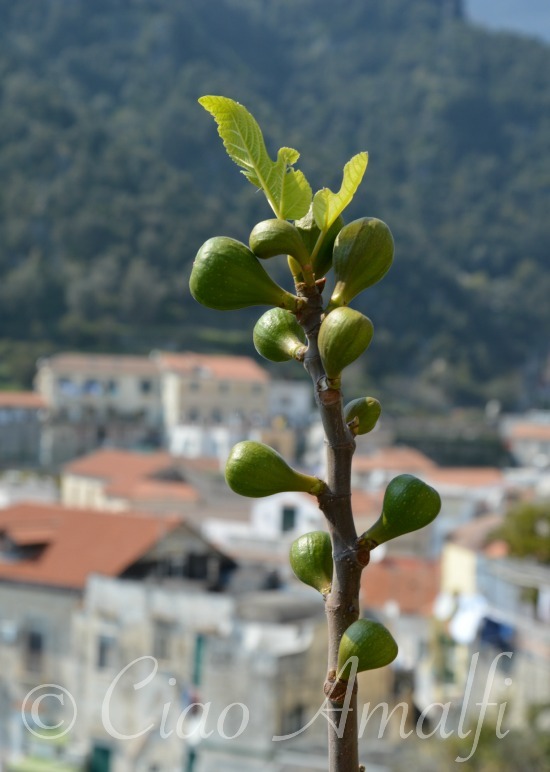 I caught my breath from the climb by stopping to admire the little figs growing and the brilliant green of their tiny leaves. There was no hurry, just me and click of the camera shutter as I fiddled around with settings and took in the view. 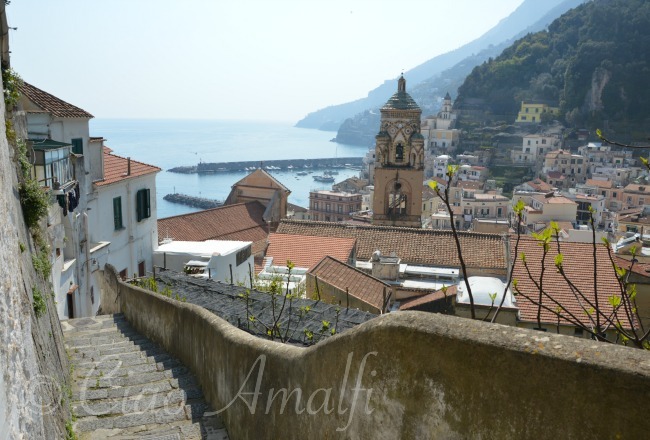 Although I was trying to get to an even higher spot in Amalfi, I must have taken a different turn, because soon the steps were going down again. Along the way I passed the most incredible garden. I peeked over a gate and saw a terrace of earth tilled in rows and little onions growing. 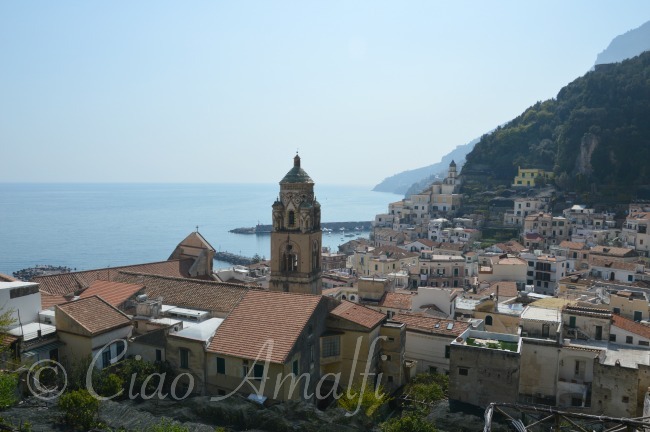 But what made it so special was the panoramic view of Amalfi. Not a bad backdrop for a bit of gardening you could say. I love how nothing is the same in Amalfi. Every doorway, every entrance, every corner is different. It feels old and lovingly personalized at the same time. This curved hand railing with decorative cut out motifs caught my eye. I could imagine running my hand along its smooth surface on the way home. The ornate bell tower of the Duomo kept popping up in different places, which was so much fun to discover. Sometimes I’d see it perfectly framed through an arched passageway or turn a corner and find just the top of it peeking over another building. 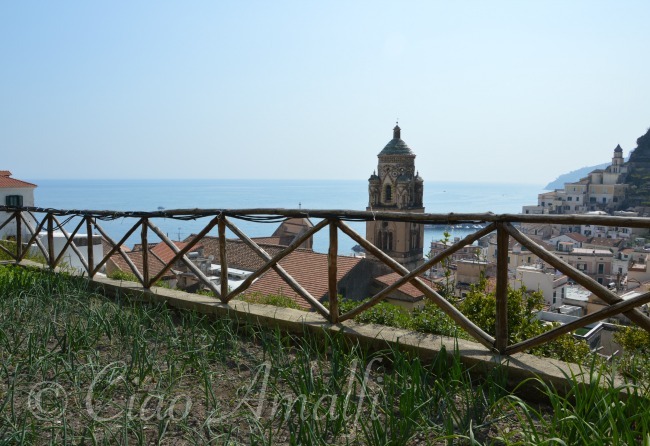 I wondered just how many views there might be of the bell tower in Amalfi. Amalfi can still stop in my tracks so easily. Walking down a staircase with knees just a bit wobbly, I stopped and glanced up. 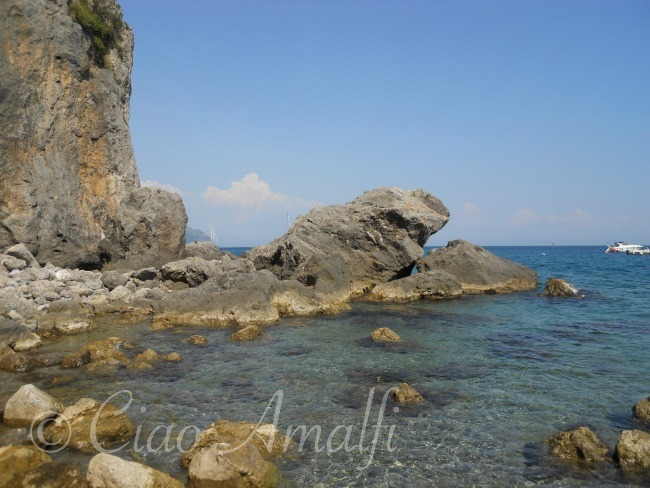 What I saw was the sun sparkling on the sea until Capo di Conca – like it was right there in front of me within reach. Did you recognize that cross? Scroll back up and look closely at the first photo. At the very top of the facade of the Cathedral there’s a cross. This is the same cross but from behind! I ended up back in the main piazza and took a good look up at the facade of the Cathedral again. I love how a change of perspective changes the way you see. 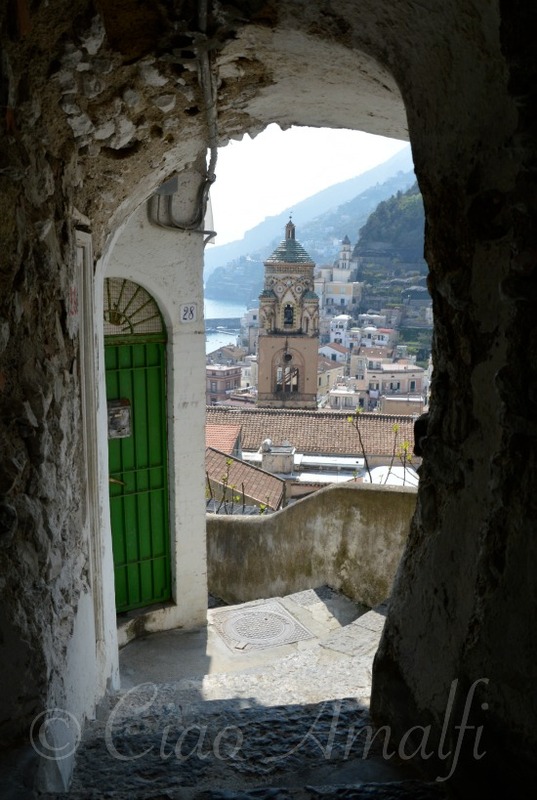 The next time you’re in Amalfi, I encourage you to spend some time getting lost. Even if you’re not up to many steps, you’ll find some interesting passageways and tiny piazzas to discover. 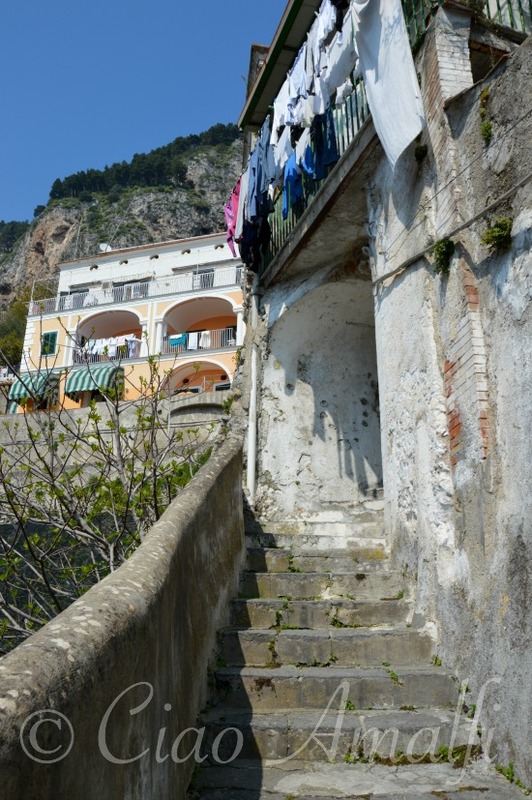 The journey of wandering among the steps of Amalfi to find them is just the beginning of the fun!